Before her morning class began, Connsuela Bautista headed straight to the principal’s office. The day before, the Southeastern Randolph Middle School girl had gotten into an altercation with another student. Though the school allowed Connsuela to go home and return to campus the next day, determining that the conflict was not likely to escalate, she was met at the principal’s office by sheriff’s deputies the next morning. Acting with teenage frustration, Connsuela began to curse at the cops, and pulled out her cell phone to call her brother. The deputies arrested her, and in the process, left two garish contusions on the thirteen-year-old’s face. According to Connsuela, who is black, the officers—angered by her attitude and defiance—pressed her against a wall, struck her, and forced her to the ground, as one pressed a knee into her back. Connsuela’s experience, though brutal, is part of a trend in her school district. In the Randolph County School System, black students represent just 3.8 percent of the student population but 26.8 percent of filed juvenile complaints. And nationally, both Connsuela and Randolph County are far from alone. Recently reported data from the Department of Education’s Civil Rights Database found a significant increase in racial disparities in arrests and referrals to police for black students, and notes that students with disabilities remain vastly overrepresented among students involved in police interactions. During the 2016–17 school year, the most recent year for which data is available, schools suspended 2.7 million students. This number was about 100,000 students lower than when federal data was last collected, in 2013–14. But black boys still made up 25 percent of all students suspended out of school, and black girls made up another 14 percent—even though each group only accounted for about 8 percent of all students. At the same time, black children, about 15 percent of all students during 2015–16, were 31 percent of those arrested or referred to police for in-school behavior. Black children, about 15 percent of all students during 2015–16, were 31 percent of those arrested or referred to police for in-school behavior. This racial disparity in student suspensions and arrests is both a disruption of justice and a threat to educational efficacy. A 2015 study led by Dan Losen of UCLA’s Civil Rights Project estimated that public school children lost an estimated 18 million days of instruction in the 2011–12 school year due to exclusionary discipline policies, impeding their ability to grasp complicated material, keep up with school work, and have a safe place to stay during the school day. These missed instructional days fuel lasting and harmful academic and social effects on young people. Multiple studies indicate that suspensions and expulsions correlate with high drop-out rates, a higher incidence of having to repeat a grade level, and a higher likelihood of interacting with the juvenile justice system. 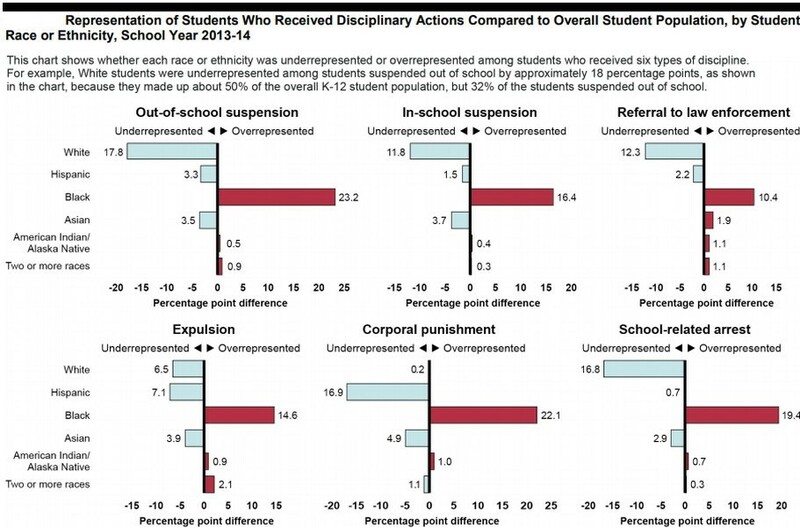 Even students who are not targeted for discipline appear to bear the negative consequences of this heavy-handedness: in schools with the highest levels of suspensions and expulsions, the academic performance of students who have not been suspended suffered. In 2014, Barack Obama’s Department of Education and Department of Justice issued guidance through a Dear Colleague letter that encouraged schools to both reduce interactions with law enforcement and examine if their discipline policies have an unfair effect, or disparate impact, on students according to race, color, or national origin. Emphasizing that schools that implement policies that disparately impact students of a particular race, color, or nationality violate Title VI of the Civil Rights Act of 1964, the “Dear Colleague” letter recognized that school safety had to include—rather than come at the expense of—the dignity of black and brown children. Regardless of the intentions of teachers and schools, students of color continue to shoulder the burden of draconian discipline practices within schools in the name of safety and school climate. A new study by the Government Accountability Office (GAO) confirms what black and brown families, and many teachers and counselors, have known for so long: that students of color, regardless of their economic background, suffer harsher discipline for equal or lesser offenses than do their white peers. For years, federal civil rights investigations have revealed that many school districts consistently invoke more severe punishments against minority students when compared to non-minority students, even when their behaviors were identical, and their past disciplinary history was similar. Research also indicates that black students are most often disciplined for more subjective offenses, such as disrespect, loitering, or making excessive noise, whereas their white schoolmates are likelier to be suspended for offenses that are more concrete, including smoking, skipping school, or vandalism. Of course, these patterns of racialized behavior enforcement extend outside of the schoolhouse door, and beyond childhood. Within the past three weeks, video evidence has captured young black people and young people of color being arrested or detained for simply existing in ways and spaces that made white people uncomfortable. We’ve witnessed two young black men arrested for sitting in a Starbucks; a graduate student questioned for napping in her Yale dormitory; two native kids detained while taking a college tour; black sorority sisters reported while performing community service; a black family harassed for having a cookout; a former Obama staffer confronted while moving into his new apartment; young black women detained while moving out of an AirBnB; and a Latino man staring down the barrel of a gun while paying for Mentos at a convenience store; and these barely scratch the surface of the many daily indignities faced by people of color, most of which are never captured on tape. Data and common sense both indicate that our school systems aren’t immune to this type of bias. Arguments that racial disparities in school discipline are not rooted in the reality of racism in America neither account for the longstanding testimony of people of color nor peer-reviewed research. Arguments that racial disparities in school discipline are not rooted in the reality of racism in America neither account for the longstanding testimony of people of color nor peer-reviewed research. That research has shown us just how deep, and subtle, the effects of those biases are. For instance, a key 2014 study found that, starting at age ten, people view black boys as older and less innocent. A statement from the author, Phillip Goff, explained, “our research found that black boys can be seen as responsible for their actions at an age when white boys still benefit from the assumption that children are essentially innocent.” A related study released last year exposed that Americans view black girls in the same light. Survey respondents were more likely to say that black girls, compared to white girls, were less innocent, require less nurturing, less support, and less protection, and know more about so-called “adult topics.” This belief, which the authors called the “adultification” of black girls, allows us to rationalize uses of force against black children—from force as violent as that which caused the deaths of Trayvon Martin and Tamir Rice, to more subtle manifestations of force, such as seeing a black girl as loud and disruptive while viewing her white classmate as inquisitive. The Obama-era guidance that attempts to lessen the harmful impacts of this bias is now under review by the current administration, which claims that the guidance has made schools less safe. Part of their argument looks to the horrifying and deadly slew of school shootings, such as the one at Marjory Stoneman Douglas High School in Parkland, Florida. Both President Trump and Marco Rubio, senator from Florida, blamed the Dear Colleague letter for tying the hands of teachers and administrators to the point where a potential school shooter slipped through the cracks. But Nikolas Cruz, the perpetrator of the massacre, had been expelled from the school prior to the shooting and was well-known to law enforcement, which never found cause to arrest him. That the shooter—a white male who carved swastikas into rifles—is being used as a justification to protect policies that disadvantage students of color reveals the depth of America’s impaired vision when it comes to viewing black and brown bodies as dangerous, rather than in danger. And, once we acknowledge the data that most school mass shootings are committed by white students, the insistence that anti-discrimination provisions precipitated this tragedy smacks of blaming children of color for the actions of white people. Another criticism of the Obama guidance posits that efforts at reduced exclusionary discipline put teachers and students in danger and make them feel less safe. But history shows that districts that implement well-chosen, well-resourced programs that use alternatives to suspensions experience higher student achievement, less student misconduct, and safer schools. Strategies such as Positive Behavioral Interventions and Support (PBIS), a behavioral psychology-based strategy used across a school campus that explicitly teaches desired behavior and uses more intensive teaching strategies for more challenging children, led to the suspension rate of students being cut in half in fully PBIS schools compared to the control group, and saw higher graduation rates and test scores. The My Teaching Partner (MTP) program relies on a web-mediated coaching cycle that allows teachers to reflect on interactions with students and meet one-on-one with coaches to discuss successes and strategies for improvement. A study that involved over 2,200 teachers showed that improved student-teacher interactions associated with MTP moved up achievement test scores, and showed that when teachers did suspend students, there was no racial disparity. Those who claim that addressing racial disparities in arrests, expulsions, and suspensions harms school culture should ask themselves why equity seems to present such a threat, and to whom or what that threat is directed. These changes aren’t always accomplished in a straightforward process, and teachers and school leaders must have substantial levels of support, resources, and training. However, the prevailing systems that currently exist are neither fair nor effective, and all our children deserve better. Too often, school disciplinary practices introduce discrimination through discretion, suffering from bias in the identification of troubling behaviors and the evaluation of how to handle them. Those who claim that addressing racial disparities in arrests, expulsions, and suspensions harms school culture should ask themselves why equity seems to present such a threat, and to whom or what that threat is directed. To admit that racial and cultural bias often permeates decisions inside and outside of schools threatens the ways in which teachers, parents, and citizens think about ourselves and our actions, forcing us to consider changing habits and procedures. It’s about time. And for too many black and brown children caught up in a system that sees their danger rather than their potential, it’s way past due.